The temple was established by a Javanese priest in 8 century. When a monk Resi Markandya from Jawa passed this place, he found the beautiful valley where the fork of two rivers, and he established this temple. They also found the great grove of medicine plants, and named the place as “Ubad = medicine plants.” The pronunciation was changed over the time, it becomes “Ubud” now. Gunung Lebah Temple is located at the beautiful valley where two rivers are joined. 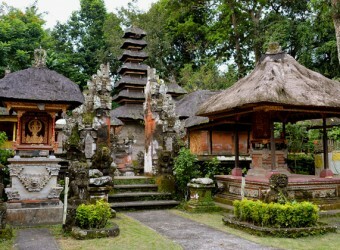 It is a historic temple that is known as the birthplace of Ubud. A mystical temple filled with dignified air. I could relax because only a few tourist coming here. I recommend you to visit this temple. This temple is also popular as power spot.